Nothing ever beats the aroma that comes from the kitchen whenever someone at home cooks. Especially when your family is skilled and always whips up delicious food that you have no problem polishing up. If your dad was a former chef, you would know what I mean. If there’s any one who never fails to impress me in the kitchen at home, it’s Dad. No matter what he’s cooking, whether is it something typically Peranakan, Western or Chinese, his food is always so appetising. I don’t think there was any instance where I didn’t finish the food that he cooked. Especially not his amazing curry! Curries to me, are like golden liquid, essential to every self-professed chilli-queen. I do like my curries spicy and it helps that Dad’s curries are always fiery-hot! 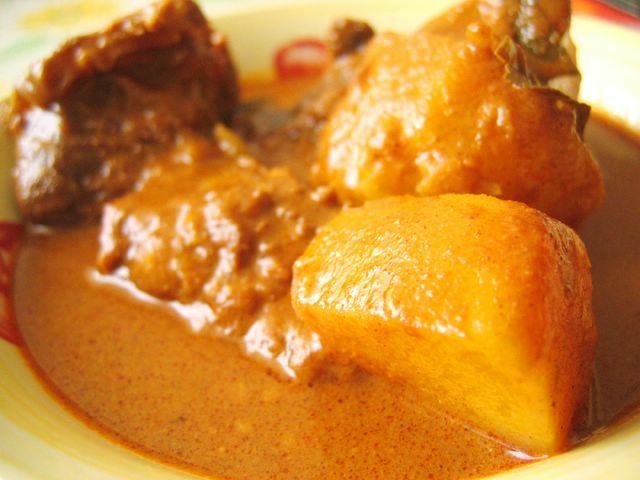 He makes the best devil curry, assam pedas, fish head curry, and yes, beef curry (as shown above)! What can I say, he is the best cook at home. I can’t beat him! I’m bent on mastering his amazing culinary skills. Just you wait and see! haha. That’s a Hainanese dish one of my aunts made. My fifth aunt to be exact. It looks alot like the Malay ketupat, except that this one’s more rectangular. 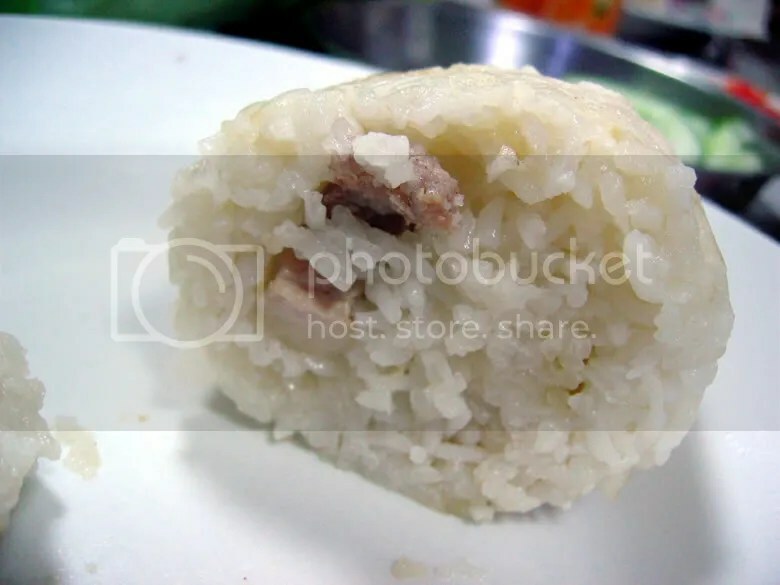 The texture is quite different too because there’s a mix of both normal white rice and glutinous rice. In the middle is some pork and chestnut stuffing – that definitely makes it authentically Hainanese. It was really yummy! My aunt brought it to my second aunt’s housewarming gathering last weekend. I love family gatherings alot. The maternal side of my family is really huge! My grandma has 8 daughters (my mum being one of them) and whenever we get together for birthdays, Christmas, Chinese New Year or whenever, every one of them will bring food – and their children. So you can imagine how noisy it is. And the spread, man, it’s so tantalising and it’s like a marvellous buffet! All of them can bake and cook really really well – all except my mother. Heh, oh well, I can’t really complain since I have a Dad who can cook. Nothing ever beats homecooked food. No matter how busy I am in future, I will make sure my own children will always have freshly cooked food at home; food that I’ve prepared myself! No way am I going to subject them to the unhealthy oily and salty msg laden food from outside. Besides, homecooked food is so much cheaper! Yes siree…. I really salute this dedicated mum who makes a Bento for her kids everyday: www.bentocorner.com Check that blog out, it’s really cool! She documents photos of the bentos she makes. So adorable and sweet! are you for real. will you marry me? 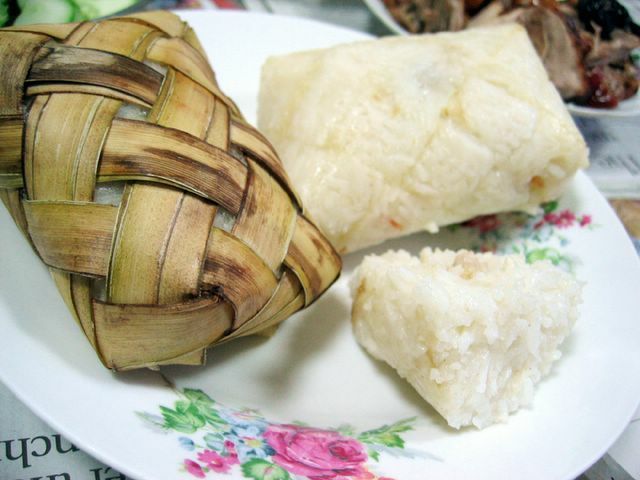 hi.. do you know how to make that rice ketupat dish? Ive come across that site before when I was nuts bout bento~ Manz its a quite a chore after a while .. I dun like my food to look like doll heads quite honestly. Are you Hainanese peranakan? Cus I sure am! Heh something common is us duncha reckon~ hehehe..
As its not a event only a theme for all of us to feel closer to each other. Send me your link too. chance upon ur blog…man..all your home cooked food sure is mouth-watering. any way you can post up your papa’s fiery curry recipe? Anon: heh I can ask my aunt though.. will post it up when i do? Joan: will try my best.. though it’ll be quite tough cos you know how they all don’t follow a fixed recipe. it’s all in his head. when you’re that good at cooking, you go by feeling. that’s what my dad does. i’ll go ask him k? but i think he buys the curry from Malacca. 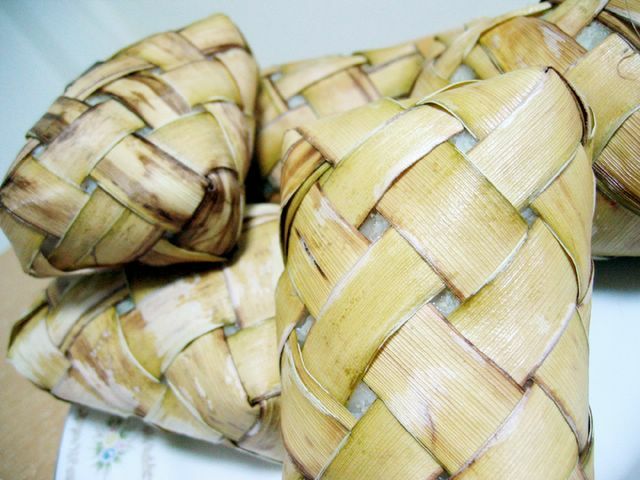 I havent seen this Hainanese “ketupat” for a long time!! Oh ya I am a Hainanese but haha cant remember what its called. I only ate this twice and that was years ago. It was made by my aunt’s late mother-in-law. Very yummy, thats why until today I still remembered how it tasted. Well, it depends on which ‘Home’ you are talking about. Cheryl, I should seriously invite you to my place one day for dinner – “Food Appreciation” – after which you will greatly appreciate all other food in the world. Not that you dun already do. But, yes. You are Blessed.